The Ramsey County Historical Society has resources to help students, teachers and mentors for Minnesota History Day. Below are some of the resources that may be the most useful to you. RCHS also has an extensive collection of historical photos and postcards that are available for searching and researching on the RCHS PastPerfect online database. Use the keyword search at the top to find images on specific topics. If you need assistance, please contact the Collections Department, or visit our Mary Livingston Griggs & Mary Griggs Burke Research Center. The Research Center contains documents and images, plus maps, books, directories and other resources. Regular hours are Monday-Thursday, 12:30-4:30. The Research Center will be closed December 19, 2018 through January 1, 2019. RCHS has documents and information from the following resources. More resources are available, see the full list of of our document collections here. HIV/AIDS Health Care Worker oral histories, 1993-2016: Transcripts of oral histories. Rondo neighborhood oral histories (from Hand in Hand Productions): Transcripts of oral histories. Leo Treadway Collection, 1968-2015: LGBTQ Rights activist and collector of ephemera. Supporting Diversity in Schools, 1988-1998. Green Line light rail development documents (District Councils Collaborative), 1993-2017. Midway Chamber of Commerce, 1919-2009. Minnesota Federation of Women’s Clubs. Mutual Aid for the Blind, 1922-1960. Saint Paul Garden Club, 1927-2017. Zonta International (Women’s club), 1927-2008. Field & Schlick Department Store, 1867-1979. House of Hope Presbyterian Church, 1840 – ongoing. Peace United Church of Christ, 1860-2005. Falcon Heights and Rose Township Records. Summit – University Planning Council, 1949-1992. West Side Collection, 1939 – ongoing. West Seventh/Fort Road Federation, 1919-2018 (being cataloged). St. Paul building permits, 1873 – 1975. St. Paul historic site survey forms, 1981-1982. Maps and photographs related to Ramsey County. In addition, we also have numerous family manuscript collections. See the list of of our document collections here. RCHS has research information on the following individuals. Please contact us for more information on the Legends and Landmarks project, and how to access these project files. James Samuel “Cornbread” Harris, Sr. 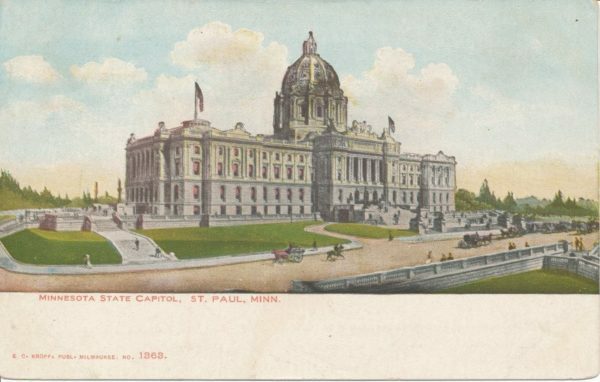 Featured image: The Minnesota State Capitol. 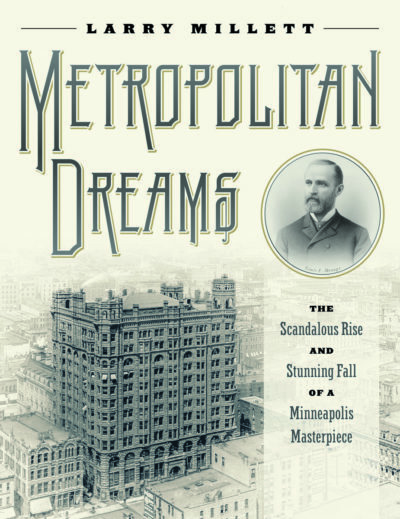 Printed by E. C. Knopf, Milwaukee. Postcard from the RCHS Collection, dated c. 1901.